If someone asks me to describe the feeling of the Fitzwiliam Museum in a word, I would say, fabulous. 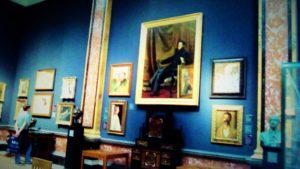 This Tuesday afternoon (9th August, 2016) we went to this museum to appreciate both the ancient and modern art. To be honest, this trip was totally rfar beyond my expectation. After receiving the warmly welcome at the gate, we were really looking forward to start ourt adventures. On the first floor, antiques were basically classifeid in variuos countries. Some of them were from South Korea, China, Janpanese, and even Egypt, while others were from Eurpean countries. The delicated vase, plates, and cutlery and many other things were on display. Looking at these things, I felt so excited to find out more stories behind them. Meanwhile, I showed great respect towards our predecessor. It is their bravery and intelligence that lays a foudation for our current happy life. Thus we could enjoy various advantages brought from the inventions and evolutions. And I felt that it was also our responsibility to devote our intelligence to make this world a better place. Besides the fascinating view from the first ground, the artworks on the second floor were even more attractive. There were different styles of paintings and printnig materials. Some were oil paintings, abstract paintings, while the others were charcoal drawing and so on. Besides, some furnitures like dining tables were also on display. Each of them was precious with long and unique history. Though I can’t touch them, I still could imgine how they were used in decades ago. To sum up, the decoration of the Fitzwiliam Museum was so beautiful . In addition, the atmosphere here was really good. This trips improved my aesthetic standards to some extent. And I felt more respected towards the artwork and tried to appreciated them more since I became to know that all these harwork were trade-off by the intelligence and sweat of predecessors.